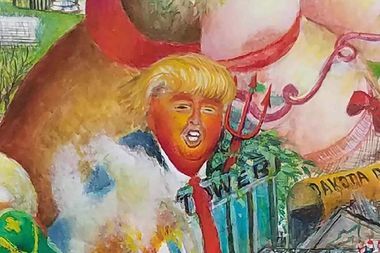 A close-up of Donald Trump as depicted in Cenedella's mural. MIDTOWN — It's gonna be yuge. A massive painting set to be unveiled at a Midtown gallery Wednesday night that was inspired by the famous "Garden of Earthly Delights" aims to capture "the entire Donald Trump fiasco” in a single piece, the artist said. The 9-by-5-foot "Fín del Mundo" depicts the Republican presidential nominee in the midst of an apocalyptic scene, clad in an elongated tie and carrying a pitchfork, with a figure appearing to vomit on him from above. The mural will be on view at the Central Park Fine Arts gallery at 211 W. 57th St., between Broadway and Seventh Avenue, until the day after the election. “The project caught my fancy mainly because of the political situation, and I was able to incorporate the entire Donald Trump fiasco in this one mural,” artist Robert Cenedella explained in a video about the piece. “Fín del Mundo” from Nicolas Jenkins on Vimeo. He chose the Spanish title “because of the insults Donald Trump has made against Spanish-speaking people around the world, and in particular… Mexicans,” he said. Despite the title, Cenedella hopes those who view the painting see it “in a positive light,” he added. “I would not have worked for almost two years on a painting I didn’t see a future for,” he said.